Contact us via chat (IM), personal research, your personal librarian or in-class consultation, telephone or e-mail. It is the mission of the University of Iowa Libraries to provide access to library materials for all members of the University community. Wherever possible, University Libraries’ staff will remove barriers that prevent equitable access for persons with disabilities. Building locations, driving directions and public parking information for UI Libraries. Find books, videos, magazines, and other answers to navigating library resources and collections. 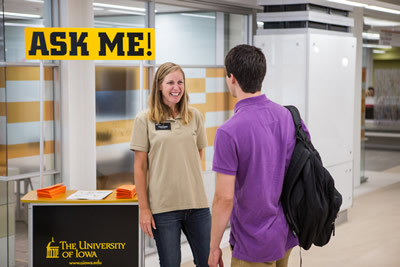 Reference librarians at the University of Iowa Libraries offer a consultation service to University of Iowa faculty, staff and students. The purpose of this service is to provide access and direction to research materials that pertain to one’s specific project or thesis. UI faculty are invited to use this service as well as to recommend this free service to their students. Online request forms available. Access to online guides and tutorials that will help you use the library, and learn about specific subject-related databases in the health sciences, psychology, chemistry, and more.